JERSEY CITY, NJ — The Hudson County Schools of Technology (HCST) Alumni Association hosted its first voter registration drive for students in County Prep and High Tech High Schools. 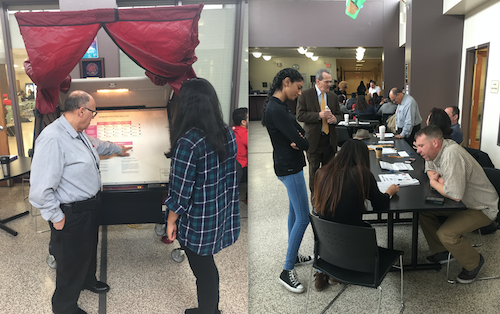 The Alumni Association partnered with the Hudson County Board of Elections to bring in voting machines and sample ballots to better educate students on how to vote, and to register students turning 18 years of age to vote in the upcoming presidential elections. The two schools participated in friendly competition by trying to best the other in getting more students registered to vote. The final tally was fairly close, with County Prep registering 104 students and High Tech registering 91. More than 200 students will have registered once mail applications are processed. Given the success of this year’s initiative, the Alumni Department plans to host voter registration drives annually between the two high schools.